Petra Kuppers, Studying Disability Arts and Culture: An Introduction. Palgrave Macmillan, 2014. Pp. 186. ISBN 978-1-137-41346-8. $37.99. 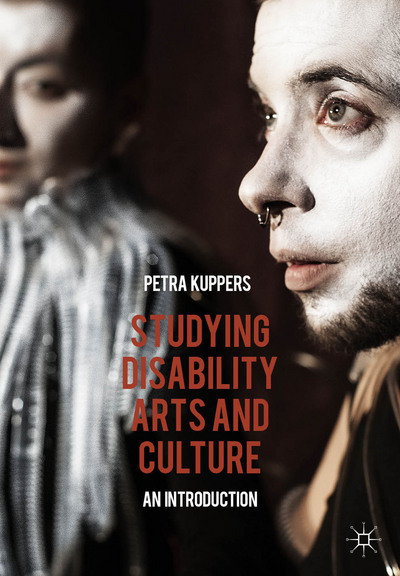 Petra Kuppers is a well-known and respected figure in the disability community at large, her work encompassing (and transgressing) the realms of academia, theatre and dance, literature, and activism. It is no surprise then that her handbook, Studying Disability Arts and Culture: An Introduction, brings all of these various backgrounds together to guide those interested in learning about “the work of disabled artists and their allies” and “artful responses to living with physical, cognitive, emotional or sensory difference” (back cover). Primarily marketed as an undergraduate text, Studying Disability Arts and Culture is a useful arts-based learning tool for anyone who wants to explore “disabled bodies and minds in theatre, performance, creative writing, art and dance” (back cover). As a past university educator and current independent scholar who sometimes dabbles in creative writing, I found Kuppers’ text admirably accessible and comprehensive—for someone new to disability studies in general or to disability-centred art practices specifically, this handbook is a useful resource. Studying Disability Arts and Culture is an excellent example of an accessible text. There is plain language used throughout, which means that terms that may be unfamiliar are always defined, and word choice and sentence structure will be easy to follow for most readers and types of learners at the undergraduate level. Each chapter begins with a bullet pointed list of key ideas Whenever there is a written excerpt or image, students are given brief contextualization of the piece along with guided questions and activities to fully analyze the text. Kuppers takes care to use inclusive language that resists the marginalization of disabled people (notably using “nondisabled” to describe people without disabilities). Additionally, the handbook encourages conversations and analyses that include the frames of gender, sexuality, race, class, and disability, as these are all intersecting points of identity and privilege (or lack of privilege). Studying Disability Arts and Culture is divided into two main parts: the first half dealing with learning disability studies basics (such as definitions, language use, key theoretical ideas), and the second half focusing on specific themes of disability arts and culture (such as the freak show, superheroes, and the [medical] institution). There are eleven chapters in total, and within each chapter, there are exercises and activities to complete, excerpts from key disability studies scholars and disabled artists, and clearly laid out explanations of how to move through and process the material (both at the individual- and group-learning level). I particularly like the way Kuppers begins the handbook with the chapter “Setting Up,” wherein a series of exercises are outlined to get students thinking about the ways they (and others) inhabit and make use of the physical spaces around them. For example, one exercise has students laying on their backs around the room—if they are able—and taking note of how it feels to talk without the pressure of visual feedback, such as nodding and eye contact. Kuppers instructs her readers: “As you find your way through this study guide, see if you can reach back to these embodied exercises, and find ways of holding against normative rules for classroom engagements, in agreement with your teacher and fellow students” (5). From the outset, the handbook encourages students to get comfortable with being uncomfortable about discussing disability (and its complex intersections with gender, sexuality, race, and class), to be active participants in their learning experience, and to be open to new ways of being in the classroom (or creative) space. In Part 2, the exercises and activities are generally longer and more intensive than in Part 1, and Kuppers initiates it by offering two exercises that will help keep students on track as they tackle the new material and the suggested supplementary reading for each section. The first exercise is “Looking up Definitions,” which lists a series of questions to help students “decode any terms or formulations you find hard to understand” (75); and the second exercise is “Study Circle,” where Kuppers explains how students, working as a group, can allocate specific tasks/roles to readers and make sense of a text collaboratively (75). Again, the handbook’s structure and open pedagogic style addresses, as best as any one text can, both individual and group learning practices. I definitely recommend Studying Disability Arts and Culture to instructors of undergraduate students in theatre, performance, creative writing, art, and dance courses. The breadth of arts-based examples and discussions provide thoughtful and creative challenges for groups of all sizes and demographic. I also think that fiction writers interested in exploring disability identity—in all its complexity and diversity—would find this book helpful as it provides ample material for self-directed reflection and instruction, and could easily be used as a resource for writing groups as well.